In this 5 hour class, you will learn all the basics to making jewelry with simple hand tools. You will learn to lay out and transfer designs, saw, pierce, drill, file, texture, forge, anneal, polish, and rivet. 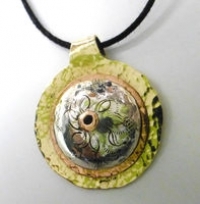 You will go home with a beautiful layered multi-metal pendant showcasing the skills that you have learned. Pre-registration required. Visit thecuriousforge.org/event for more information and to register.